The dollar theater is one of the few industries that fortunately has not kept up with inflation. I went on my first date with my wife back in 1989 to Cinemark Movies 8 in Provo and we paid $1 to see The Dream Team. Today it still only cost between $1.50-$2.00 to see a movie there depending on the time of the showing and the day. You can't complain about that. I wish food and fuel prices would follow the lead that the dollar theater has set. I also appreciate the dollar theater when it comes to movies that only got okay ratings. I hate shelling out good money for new release movies that don't end up being that great, but I don't mind it as much if I'm only parting with a couple bucks. I love going to movies and love the theater ambiance, but I'm afraid going to the movies is a dying trend. I think technology and streaming movies will soon replace the public theater experience. 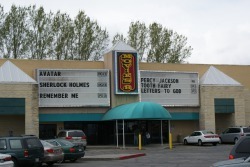 Until that happens, I will continue to enjoy the movies at the dollar theater along with all the other movie enthusiasts, frugal people, and poor BYU students. You can see what is currently playing at the Cinemark Site.